Beautiful wooden cabinet from the beautiful interior brand Nordal. This Nordal cabinet is made of teak with natural webbing. The cabinet is 100 cm wide, 50 cm deep and 160 cm high. Equipped with two doors and shelves. This modern black Hübsch metal case is equipped with mesh so you can display your favorite items in the closet. The cabinet is 50cm high, 80cm wide and 37cm deep. How do you combine this cupboard? 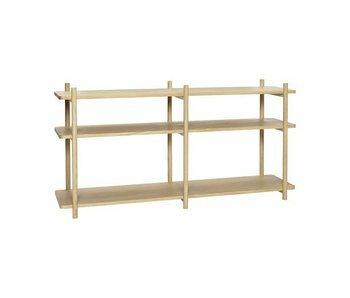 Nice Hübsch storage cabinet with 3 shelves. This red cabinet is made of wood and metal and is great in your interior! The cabinet has a length of 90cm, width of 40cm and height of 60cm. Nice Hübsch storage cabinet with 3 shelves. This cabinet is made of oak and very nice to combine with the playful look! The case has a length of 81cm, width of 49cm and height of 160cm. 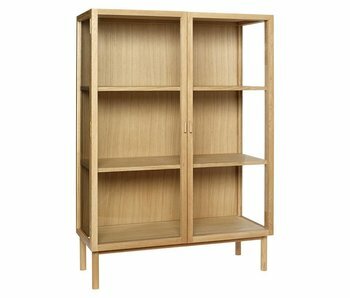 Nice Hübsch storage cabinet with 3 shelves. This cabinet is made of oak and very nice to combine with the playful look. The case has a length of 80cm, width of 45cm and height of 90cm. Nice Hübsch storage cabinet with 3 shelves. This cabinet is made of oak and very nice to combine with the playful look. The cabinet has a length of 150 cm, width of 38 cm and height of 75 cm. 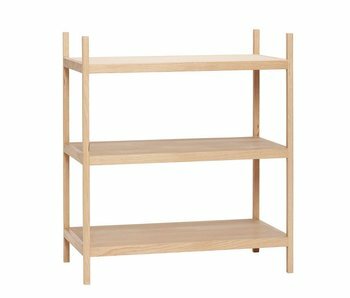 Nice Hübsch storage cabinet with 3 wooden shelves. The frame of the cabinet is made of black metal and beautiful to combine with the playful look. The cabinet has a length of 102cm, width of 37cm and height of 91cm. Nice Hübsch storage cabinet with 3 shelves. The frame of the cabinet is made of black metal and beautiful to combine with the playful look. The cabinet has a length of 104cm, width of 35cm and height of 91cm. Nice Hübsch storage cabinet with 4 wooden shelves. The frame of the cabinet is made of black metal and beautiful to combine with the playful look. The cabinet has a length of 100cm, width of 39cm and height of 150cm. Nice Hübsch storage cabinet with 5 shelves. This case is made of black metal and beautiful to combine with the playful look. The cabinet has a length of 100cm, width of 50cm and height of 196cm. This beautiful Hübsch sideboard is made of oak and has two doors for easy storage. The cabinet has a minimalist appearance due to the natural wood. Beautiful in a modern interior! 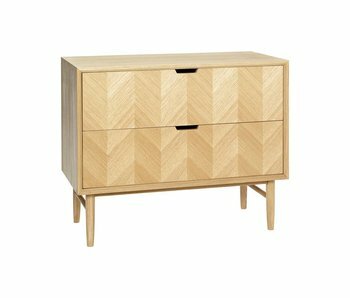 This beautiful Hübsch sideboard is made of oak and has two drawers for easy storage. The cabinet has a minimalist appearance due to the natural wood. Beautiful in a modern interior! This modern Hübsch wooden cabinet is equipped with lots of glass so you can display your favorite items in the closet. This wooden cabinet is 50cm high, 110cm wide and 40cm deep. How do you combine this cupboard? This modern Hübsch wooden cabinet is equipped with lots of glass so you can display your favorite items in the closet. This wooden cabinet is 187cm high, 110cm wide and 50cm deep. How do you combine this cupboard? This modern Hübsch wooden cabinet is equipped with lots of glass so you can display your favorite items in the closet. This wooden cabinet is 140cm high, 100cm wide and 42cm deep. How do you combine this cupboard? This modern black Hübsch metal case is equipped with mesh so you can display your favorite items in the closet. The cabinet is 150cm high, 80cm wide and 33cm deep. How do you combine this cupboard? This beautiful HKliving webbing sideboard is a real addition to your interior! This liver-colored handmade HKliving sideboard has three doors and is made of wood and cane. Equipped with a three shelves. These beautiful HKliving Retro webbing bedside tables are a real addition to your bedroom! These white handmade HKliving cupboards have a door and are made of wood and cane. This set consists of two pieces. Tough HK-Living cupboard made of wood in white. The locker is made of mango wood with a single door and two shelves. The cabinet is ideal to combine in a large hall or the bedroom. This beautiful HKliving Retro webbing cabinet is a real addition to your interior! 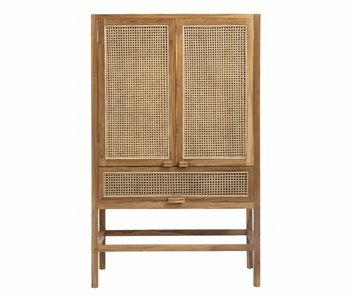 This white handmade HKliving webbing cabinet has a door and is made of wood and cane. Equipped with a two shelves. This beautiful HKliving Retro webbing cabinet is a real addition to your interior! 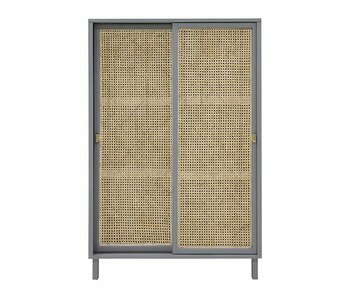 This gray handmade HKliving webbing cabinet has two sliding doors and is made of wood and cane. Equipped with a four shelves. This beautiful HKliving Retro webbing cabinet is a real addition to your interior! 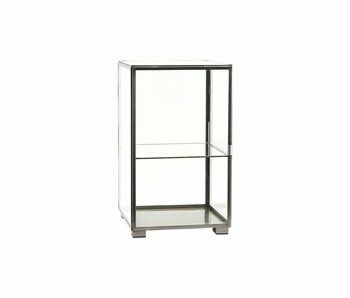 This light gray handmade HKliving webbing cabinet is made of wood and cane. Equipped with a 6 shelves. This beautiful HKliving Retro webbing cabinet is a real addition to your interior! 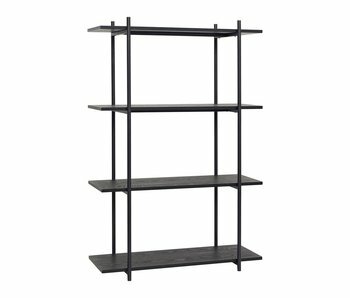 This black handmade HKliving webbing cabinet is made of wood and cane. Equipped with a 6 shelves. This modest House Doctor cabinet is made of zinc and has a glass shelf. The sides of the cabinet are also equipped with glass and ideal for displaying your latest acquisitions! How do you combine this cupboard?